If you want to give access to a folder to your friends or family, you have to share it. In the Share configuration settings, it is possible to grant other users extended rights to edit and delete in the shared folder. The password protection, the share duration and the user permissions can be adjusted anytime. 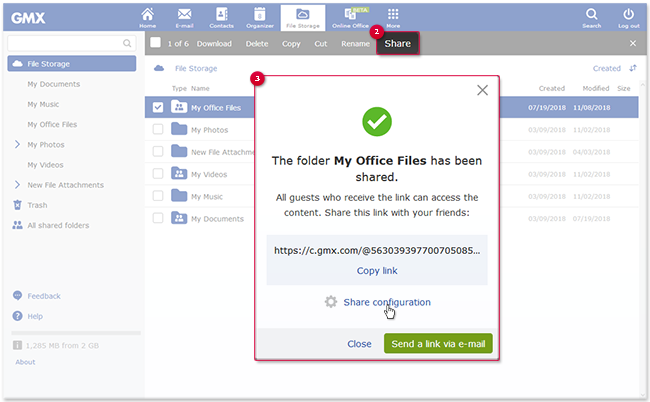 If you share a folder, the recipients of the share link can access the folder in your File Storage and download the files. In the Actions menu, click Share. 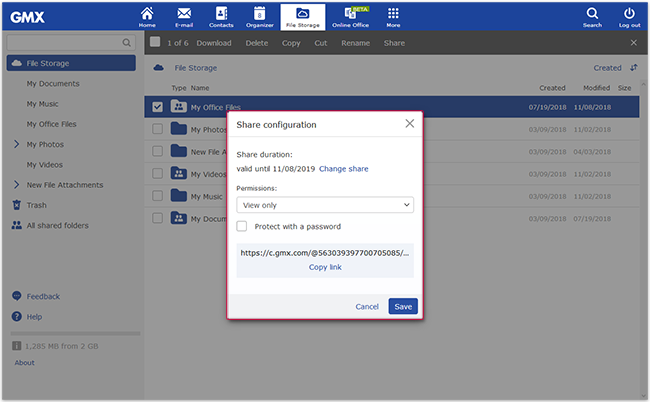 If you have already shared a folder and want to make changes in the Share configuration settings, click Edit share. A window with the share link and the option for further share configuration appears. Allow other users to share photos, videos and other files with you by selecting Add and delete files under Permissions. Protect the share by ticking the box next to Protect with a password and creating a password with at least 5 characters. Limit the share duration for other users by clicking Change share and setting 1 week, 1 month or year as the share duration. Save the share configuration by clicking Save. A confirmation window appears to show you the share configuration settings you made. You can now send the share link via e-mail. Send the share link to the recipients by clicking Send link via e-mail. You shared a folder with other users.